Aeneas first led a group of Trojan refugees to its hillsides. Romulus murdered his brother at its foundations. Caesar eyed it greedily as he crossed the Rubicon. 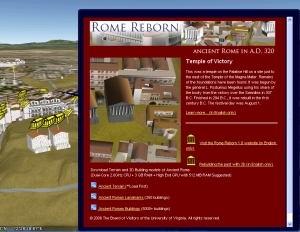 And now Google has brought the ancient city of Rome to life in all of it’s 3 dimensional glory in Google Earth! So it was with giddy excitement that I read via Frank Taylor’s Google Earth Blog the long awaited Rome 3D Layer has been officially launched. 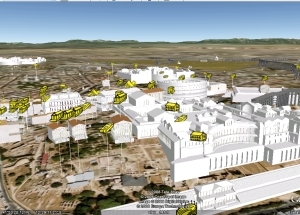 Initially started as the University of Virginia’s Rome Reborn project, the 3D model of the city was recently converted into a Google Earth layer for the rest of us outside of academia to enjoy. I’ve spent most of my free moments today strolling through the streets of ancient Rome, hanging out at the Circus Maximus, and exploring the interiors of the buildings (there are 11 that you can poke around inside of). This is a tremendous resource for any history teacher, in helping to compare the size and growth that Rome has experienced, and to give students a tiny glimpse back into time. The models of the city can be found down in the layers panel under the Gallery, and include over 250 place marks for the most noteworthy structures. A quick check of the Temple of Victory informed me that it was built by a conquering general, Postumius Megellus, and sat atop the Palantine Hill (one of the swankiest places to build in the ancient city). Those place marks include a brief history of the structure, and links to more information including any literary references, a huge plus for language arts teacher studying classical texts. The place marks are included with different languages, so those studying Spanish or French could get a good taste for some of the culture that helped shape their particular language of study. Each of the 250 place marks includes a link to turn on or off the topographic layer, or the more than 6,700 3D structures that are included with this layer. That’s right, 6,700 3D buildings, which means my computer has been crawling along today trying to display all of that. If you have an under-powered machine, you might want to consider turning off any ancillary programs before launching the 3D Rome layer. This is an immensely exhaustive resource that would probably benefit Social Studies, Language Arts, and Latin teachers across many grade levels. I’ve been geeking out about it all day long, and fully intend to sift through it some more this weekend for my own amusement. WARNING: This requires a beefy machine to run! At least a dual core with more than 3GB RAM, plus a video card with 512MB of RAM by the creators of the resource! Previous:When Did I Get So Popular All of a Sudden?